Smooth, soulful and technically adept solo piccolo bass guitar gives way to a fluffy holiday groove with full band, featuring Orlando Thompson on keyboards. He is known for his virtuosity on the electric bass using picking, tapping, and fingerstyle, along with his genre bending style and adaptability and onstage energy. Eric Gales, Ghost-Note feat. MonoNeon, Jonathan Scales Fourchestra, Albert Cummings, Everyone Orchestra, Jeff Sipe & Billy Cardine, Jazz is Phish and James Brown Dance Party. Cody even jammed with one of his heroes, guitar master Tommy Emmanuel, in 2014. In 2015, Cody's viral video with Chaisaray Schenck on drums reached over one million views worldwide. In 2016, Cody & the Eric Gales Band co-billed with Joe Satriani, Steve Vai, and Dweezil Zappa at Guitare en Scene Festival for Joe Satriani's Birthday Bash! In 2017, Cody & the Eric Gales Band shared the bill with Santana, Buddy Guy, Bonnie Raitt, Zac Brown, Patti Smith, Mavis Staples, Jethro Tull, Snarky Puppy, and others at the Byron Bay Blues Festival in Australia. Cody is a certified instructor at ScottsBassLessons.com. 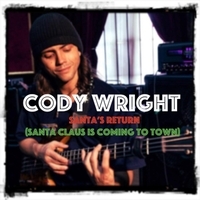 The tune also features Wright's own idea "Santa's Return" as the second half, featuring a full band (played by Wright) with special guest Orlando Thompson on keyboards.